Playing the bonang barung, a gamelan instrument consisting of a horizontal rack of small gongs. Javanese gamelan is an ensemble comprising mainly of percussion instruments performed by up to 20 musicians. 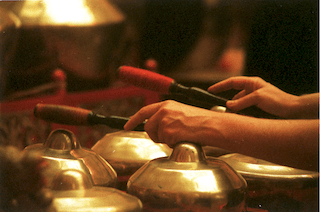 The music of the gamelan involves highly evolved melodic relationships and rhythmic structures as well as a complex system of improvisation akin to jazz. Although gamelan music requires many years of study to master, its sonorous and haunting sound captivates even the uninitiated listener immediately. Gongs of all sizes, bronze chimes, xylophones, drums, strings and flute weave a web of melodies and rhythms which come together at the awesome strike of the big gong. Over this complex accompaniment male and female singers chant poetry evoking the ancient Hindu-Buddhist world of Java. Depending on the mood of the piece, gamelan music can be relaxed and playful, joyous and festive, or thundering and majestic, at one end of the spectrum. However it is the meditative character of the slow and refined pieces – delicate, sensuous, profoundly mystical and serene like “moonlight poured over fields” – so rare in a hectic modern society, which gives Javanese gamelan its particular appeal to audiences around the world. Langen Suka specialises in traditional Central Javanese gamelan music from the city of Solo (officially named Surakarta). Often compared with the related but nevertheless distinctly different style of gamelan music in neighbouring Yogyakarta, Solonese gamelan music is characterised by faster tempos, a smoother overall texture and tonal quality, and a certain vitality afforded by its willingness to absorb outside influences (including those from Yogyakarta!). Karawitan is the term for the classical tradition of gamelan music which encompasses a great variety of forms and performance contexts. It accompanies wayang kulit (shadow puppet theatre), dance and other theatrical genres, but is also enjoyed as musical entertainment, whether as part of ritual ceremonies or broadcast live on radio. At the heart of karawitan is the phenomenon of colotomic structure, which is essentially a repeated rhythmic phrase articulated at various levels by gong-type instruments and drums. Sometimes the pattern is short and clearly perceptible, other times it is stretched out and overshadowed by melodic and textural elements. Although the gamelan consists mainly of percussive instruments, karawitan is inherently a melodic music in which all but the colotomic instruments perform simultaneous variants of an “inner melody” which identifies a particular piece. The resulting grand heterophony is highly complex in the way in which the individual instruments relate to each other, especially as the performance practice of some instruments allows for a limited degree of improvisation and freedom. For more information about Javanese gamelan, see the list of books, articles and other websites on our Resources page.